A new 3D photo from NASA's Dawn spacecraft reveals a stunning glimpse inside a massive crater on the huge asteroid Vesta. The new image shows dark streaks of carbon-rich material radiating out from the 9-mile-wide (15 kilometers) Cornelia Crater. The coal-black material speckles the rim and flanks of the crater, which is found in Vesta's southern half. Dawn captured the images that make up the 3D mosaic while orbiting Vesta from an altitude of 420 miles (680 km), researchers said. The dark material is common around the edges of two enormous impact basins in the southern hemisphere of Vesta, which at 325 miles (523 km) wide is the second-largest body in the main asteroid belt between Mars and Jupiter. 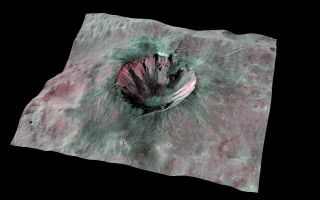 These two basins, which are known as Veneneia and Rheasilvia, were likely formed by asteroids between 25 and 36 miles (40 to 60 km) wide, scientists have said. The Rheasilvia impact probably blasted out about 250,000 cubic miles (1.04 million cubic km) of material — enough to fill the Grand Canyon 1,000 times over. Veneneia, which apparently formed between two and three billion years ago, is about 250 miles (400 km) across. The younger Rheasilvia is even larger; at 310 miles (500 km) wide, it spans virtually all of Vesta's diameter. A recent analysis of the carbon-rich dark stuff suggests that much of it was delivered by the object that created Veneneia, researchers said. Some of the material was then likely covered up by the massive impact that produced Rheasilvia. Scientists think Vesta is a protoplanet left over from the solar system's early days, a building block whose progression toward full-fledged planet was halted by Jupiter's powerful gravitational pull. The $466 million Dawn spacecraft arrived at Vesta in July 2011 and orbited the intriguing object for more than a year. In September 2012, Dawn departed for the dwarf planet Ceres, the largest resident of the asteroid belt. Dawn is slated to arrive at Ceres in early 2015.